Finally, the vast amounts of government-backed cheap capital that these banks raised in the financial markets in 2009, will all have to be refinanced in 2012 at interest rates that could be as much as five times higher than those they got last year.”Goldman Sachs alone has something like $21 billion of debt due then,” says Tim Backshall, chief strategist with Credit Derivatives Research…In fact, Goldman’s massive debt pales by comparison to the amounts raised by others last year under the government-backed programs: Citigroup raised $64 billion, Bank of America $44 billion, J.P. Morgan Chase $39 billion, and Morgan Stanley $25 billion. And most of this debt is due 2012. Now, I am not saying that 2012 will be the year that the USA’s economy completely collapses (I think Bible prophecy shows that it will be a little past then, Does God Have a 6,000 Year Plan? What Year Does the 6,000 Years End?). But the reality is that the world’s financial system still has major problems. That banks and some countries are going to face some in 2012. And that ultimately, the USA’s dollar will be totally worthless (as my book 2012 and the Rise of the Secret Sect states on page 333). The world’s financial system will change, and the USA will no longer be on top. 2012 and the Rise of the Secret Sect This is a link related to a book by Bob Thiel (COGwriter). This also has YouTube videos. This book documents and explains hundreds of prophecies. And since it was published, many have already started to come to pass. 2012 y el surgimiento de la secta secreta Nuevo libro del Dr. Thiel en Español. Posted in Prophecy | Comments Off on 2012 Banking Crisis? BERLIN — President Horst Köhler of Germany resigned on Monday amid a barrage of criticism for remarks he made a week ago during a surprise visit to Afghanistan. Mr. Köhler, who was less than a year into his second term as president, shocked Germans earlier this month when he said that the country’s soldiers serving in Afghanistan or other peacekeeping missions were deployed to protect German economic interests. “A country of our size, with its focus on exports and thus reliance on foreign trade, must be aware that military deployments are necessary in an emergency to protect our interests, for example, when it comes to trade routes, for example, when it comes to preventing regional instabilities that could negatively influence our trade, jobs and incomes,” Mr. Köhler said. It is a shame when politicians feel that they have to resign when they speak what they feel is the truth. Whether or not some like Baron Guttenberg will want this ceremonial post will be seen. How this resignation might affect German politics and prophecy is not yet clear. But because of the timing of it, it likely will. Should a Christian Vote? This article gives some of the Biblical rationale on this subject. Would Jesus vote for president? Is voting in the Bible? This is a subject Christians need to understand. Can the Great Tribulation Begin in 2010, 2011, or 2012? Can the Great Tribulation begin today? What happens before the Great Tribulation in the “beginning of sorrows”? What happens in the Great Tribulation and the Day of the Lord? When is the earliest that the Great Tribulation can begin? What is the Day of the Lord? Three German-built Israeli submarines equipped with nuclear cruise missiles are to be deployed in the Gulf near the Iranian coastline. The first has been sent in response to Israeli fears that ballistic missiles developed by Iran, Syria and Hezbollah, a political and military organisation in Lebanon, could hit sites in Israel, including air bases and missile launchers. As Iran continues to make statements that Israel finds threatening, Israel is taking its own steps to hope to minimize the potential damage that some of its declared enemies might do. Iran’s politicians hope to cause a situation when an Iranian Islamic leader, known as the Mahdi/Imam will rise up (this leader is alluded to in certain Persian and other Islamic writings). Despite the fact that Iran’s top politicians hope that Iran will gain leadership of the Islamic world, according to biblical prophecy, this will be a hollow hope. Since Iran is basically east of Israel, and not south, people such as Dr. R. Meredith, presiding evangelist of the Living Church of God, have felt that Iran could not be the leader of the power prophesied in the Bible and called the King of the South (Daniel 11:40). And while some will likely consider him to be the Mahdi/Imam, he is not at all likely to be Iranian. I have long felt that Israel was likely to do something in order to eliminate Iran as a threat. But that may come at a high price. It is certainly possible that Israel may cripple Iran enough that Iran (and some of its allies) will be satisfied to support (as oppose to lead) an emerging Islamic power that both Islamic and biblical prophecies foretell. The stationing of Israeli submarines near Iran may well fit into what is needed for those prophecies to come to pass. The Arab World In the Bible, History, and Prophecy The Bible discusses the origins of the Arab world and discusses the Middle East in prophecy. What is ahead for the Middle East and those who follow Islam? What about the Imam Mahdi? Is There A Future King of the South? Some no longer believe there needs to be–but they are in error. Might Egypt, Islam, Iran, Arabs, or Ethiopia be involved? Might the King be called the Mahdi? What does the Bible say? Water Woes in Egypt. The Nile River flows through 10 nations before reaching Egypt. It is Egypt’s major source of fresh water. Experts estimate that Egypt’s demand for water will exceed its supply by 2017. Nations “upstream” from Egypt want to implement water-related energy projects, but are prevented from doing so by a 1929 British-initiated treaty that gives Egypt veto power over these nations. Referring to Egypt’s control of the Nile, a western diplomat observed “Egyptians are behaving with the Africans the way they accuse Israel of behaving with the Palestinians: they say they are ready to negotiate but without committing to the difficult issues.” An Egyptian diplomat countered, “Egypt only has water coming from the river. The Africans have it from the rains.” Egypt’s large population and strong military ensures its access to waters that originate in other nations (AFP, May 12, 2010). For millennia, Egypt has played an influential role in world affairs. God prophesies that, at the end of the age, a king of the south (south of the Holy Land) will arise that will oppose a king of the north—and Egypt could play a powerful role in this “southern” kingdom. According to Bible prophecy, the northern king will overcome the southern king and take Egypt captive, along with its riches (see Daniel 11). Meanwhile, Egypt’s water shortages will put pressure on the nation and those sharing the Nile’s tributaries. This could foment future turmoil in this region where peace is scarce. Just like it will take economic problems and perhaps severe civil unrest for the King of the North to rise up, it will probably take a combination of factors for the King of the South to rise up. Water may be a factor as it is also an issue for the nation of Israel. 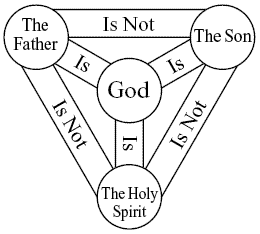 The above drawing is used by Trinitarians to explain the Trinity, even though it clearly violates laws of logic. Today is known as “Trinity Sunday”. This “holiday”, like many observed throughout the world, does not have a biblical basis, nor was it observed by the early church. The Trinity is the term employed to signify the central doctrine of the Christian religion (The Blessed Trinity, 1912). Like other doctrines that became central to the faith, however, belief in the Trinity was a historical development, not a “given” from the early years of the faith. A. The basic notion of the Trinity is that there are three persons in the Godhead: Father, Son, and Holy Spirit. These are all equally God and of the same substance, but despite the fact there are three persons, together, they compromise only one God, indivisible in nature. B. This doctrine does not appear to be a doctrine pronounced by the historical Jesus, Paul, or any other Christian writer during the first hundred years or so of Christianity. C. It cannot be found explicitly stated in the earliest Christian writings. The only passage of the New Testament that declares the doctrine (1 John 5:7-8) was not originally part of the text but was added by doctrinally astute scribes at a later date (it is not found in any Greek manuscripts until the 11th century) (Ehrman B. From Jesus to Constantine: A History of Early Christianity, Part 2. The Teaching Company, Chantilly (VA), 2004, p. 43). The binitarian formulas are found in Rom. 8:11, 2 Cor. 4:14, Gal. 1:1, Eph. 1:20, 1 Tim 1:2, 1 Pet. 1:21, and 2 John 1:13…No doctrine of the Trinity in the Nicene sense is present in the New Testament…There is no doctrine of the Trinity in the strict sense in the Apostolic Fathers…(Rusch W.G. The Trinitarian Controversy. Fortress Press, Phil., 1980, pp. 2-3). 251 In order to articulate the dogma of the Trinity, the Church had to develop its own terminology with the help of certain notions of philosophical origin: “substance,” “person,” or “hypostasis,” “relation” and so on (Catechism of the Catholic Church. Imprimatur Potest +Joseph Cardinal Ratzinger. Doubleday, NY 1995, p. 74). The ancient Babylonians recognised the doctrine of a trinity, or three persons in one god—as appears from a composite god with three heads forming part of their mythology, and the use of the equilateral triangle, also, as an emblem of such trinity in unity (Beck TD. The mystical woman and the cities of the nations: or, Papal Rome and her secular satellites. 1867. Original from	Oxford University, Digitized	Aug 15, 2006, pp. 22-23). On one cylinder of translucent green felspar, called amazon stone, winch I believe to have been the signet, or amulet, of Sennacherib himself, is engraved the king standing in an arched frame as on the rock tablets at Bavian, and at the Nahr-el-Kelb in Syria. He holds in one hand the sacrificial mace, and raises the other in the act of adoration before the winged figure in a circle, here represented as a triad with three heads…the triune god, the supreme deity of the Assyrians, and of the Persians, their successors, in the empire of the East. Of the information as to the religious system of the Assyrians… It is difficult to understand such a system of polytheism, unless we suppose that whilst there was but one supreme god, represented sometimes under a triune form (Layard	AH. Discoveries in the ruins of Nineveh and Babylon: with travels in Armenia, Kurdistan and the desert : being the result of a second expedition undertaken for the trustees of the British Museum. Murray, 1853. Original from	the Bavarian State Library, Digitized	Oct 20, 2009, pp. 160, 637). Mithra, who was originally subordinate to Ormuzd, and even reduced to the third place in the triad, subsequently rose practically to the first place, supplanting Ormuzd himself. Such a process, by which the mediating member of the trinity, as the special friend and savior of men, should become first and nearest in the thoughts, and affections, and hopes of men, and hence in time first in the divine order of the gods, is most natural, and we have already found it a marked feature of the historical evolution of most of the Ethnic trinities. Thus in the Babylonian triad Marduk, the mediating sun-god, usurps the place of Ea, his father. The same was true of Vishnu-Krishna in the Hindoo trinity, who, in his capacity of god- man and mediator, reduced Brahma to almost a shadow. So Mithraism pushed Ormuzd back into a place of inferiority, or rather he was quietly displaced and forgotten. The triad was practically reduced to unity in the Mithraic faith (Paine LL. The Ethnic Trinities and Their Relations to the Christian Trinity: A Chapter in the Comparative History of Religions. Kessinger Publishing, 1901 Original from	the University of California, Digitized	Nov 20, 2007, p. 84). “I am the Father and the Son and the Paraclete.” (Didymus, De trinitate iii. 41. 1.) (Assembled in P. de Labriolle, La crise montaniste (1913), 34-105, by Bates College, Lewston (Maine) http://abacus.bates.edu/Faculty/Philosophy%20and%20Religion/rel_241/texts/montanism.html 01/31/06). Now with the heresy of the Ariomaniacs, which has corrupted the Church of God…These then teach three hypostases, just as Valentinus the heresiarch first invented in the book entitled by him ‘On the Three Natures’. For he was the first to invent three hypostases and three persons of the Father, Son and Holy Spirit, and he is discovered to have filched this from Hermes and Plato (Source: Logan A. Marcellus of Ancyra (Pseudo-Anthimus), ‘On the Holy Church’: Text, Translation and Commentary. Verses 8-9. Journal of Theological Studies, NS, Volume 51, Pt. 1, April 2000, p.95 ). The Father uncovers his bosom, which is the Holy Spirit, revealing his secret. His secret is his Son! (Valentinus. Gospel of Truth. Verse 17. English translation by Patterson Brown). In Scripture there is as yet no single term by which the Three Divine Persons are denoted together…The word trias (of which the Latin trinitas is a translation) is first found in Theophilus of Antioch about A.D. 180…Afterwards it appears in its Latin form of trinitas in Tertullian (“De pud.” c. xxi) (The Blessed Trinity. The Catholic Encyclopedia, Volume XV Copyright © 1912 by Robert Appleton Company Online Edition Copyright © 2003 by K. Knight). 1) Arians – Supporters of the position of Dr. Arius, about 10% of the attendees. 2) In-Between – Those who held a position between the Arians and Proto-Trinitarians, about 75% of the attendees. Eusebius was the main spokesperson for them. 3) The Proto-Trinitarians – Those who supported the views of Athanasius, about 15% of the attendees. Although Constantine is usually remembered for the steps he took toward making Christianity the established religion of the Roman Empire, it would not be wrong to consider him the one who inaugurated the centuries of trinitarian orthodoxy. It was he who proposed and perhaps even imposed the expression homoousis at the Council of Nicea in 325, and it was he who provided government aid to the orthodox and exerted government pressure against nonconformists. (Brown HOJ. Heresies: Heresy and Orthodoxy in the History of the Church. Hendrickson Publishers, Peabody (MA), 1988, pp. 332-333). So the scholars of the Church of Rome admit that the “conservative majority in the East” were not Trinitarians in the middle of the fourth century. There were also many “Semi-Arians” in the West at this time as well of course. Towards the middle of the fourth century, Macedonius, Bishop of Constantinople, and, after him a number of Semi-Arians, while apparently admitting the Divinity of the Word, denied that of the Holy Ghost (Forget J. Transcribed by W.S. French, Jr. Holy Ghost. The Catholic Encyclopedia, Volume VII. Copyright © 1910 by Robert Appleton Company. Online Edition Copyright © 2003 by K. Knight. Nihil Obstat, June 1, 1910. Remy Lafort, S.T.D., Censor. Imprimatur. +John Cardinal Farley, Archbishop of New York). The trinity was finally formally adopted at the Council of Constantinople in 381–though many in the Roman and Orthodox Church believed in versions of it prior to this. …let us believe in the one diety of the father, Son and Holy Spirit, in equal majesty and in a holy Trinity. We authorize the followers of this law to assume the title Catholic Christians; but as for the others, since in out judgment they are foolish madmen, we decree that the shall be branded with the ignominious name of heretics, and shall not presume to give their conventicles the name of churches. They will suffer in the first place the chastisement of divine condemnation an the second the punishment of out authority, in accordance with the will of heaven shall decide to inflict…(Theodosian Code XVI.1.2. Cited in Bettenson H, ed., Documents of the Christian Church, London: Oxford University Press, 1943, p. 31). So the trinity need the force of Roman punishment against non-trinitarians. The doctrine of the Trinity is fundamental for the Christian faith, even though the doctrine was not clearly formulated and generally accepted by an ecumenical council until the fourth century..The Council of Chalcedon, the decisions of which were reaffirmed at the Trullanum of 680-681, gave us the formulation of Christological doctrine we now call orthodox. (Brown HOJ. Heresies: Heresy and Orthodoxy in the History of the Church. Hendrickson Publishers, Peabody (MA), 1988, pp. 127,192-193,194). …the councils defined once and for all the Church’s teaching upon the fundamental doctrines of the Christian faith — the Trinity and the Incarnation. All Christians agree in regarding these things as ‘mysteries’ which lie beyond human understanding and language…the first two, held in the fourth century…formulated the doctrine of the Trinity…The work of Nicea was taken up by the second Ecumenical Council, held in Constantinople in 381…While Athanasius emphasized the unity of God — Father and Son are one in essence (ousia) – the Cappadocians stressed God’s threeness: Father, Son, and Holy Spirit are three persons (hypostasis) (Ware T. The Orthodox Church. Penguin Books, London, 1997, pp. 20-23). Despite the fact that up until late in the fourth century, most who professed Christ did not clearly hold to a Trinitarian view of the Christian Godhead, over time (and partially due to Imperial pressure), the Trinity became accepted by the majority of those who professed Christ. In modern times, this has happened to groups such as the old Worldwide Church of God, which is now called Grace Communion International, and is based in Southern California (although any pressure would have come from the desire to confirm to majority Protestant positions as opposed to any governmental influence). The old Worldwide Church of God held to a Semi-Arian (sometimes referred to as a binitarian) view of the Godhead. After the death of Herbert W. Armstrong in 1986, the leadership that took over abandoned that church’s historical aversion to the Trinity. Those that disagreed with such changes to the historical Christian teachings left and many of the older leaders are now part of the Living Church of God. Have you ever wondered why the doctrine of the Trinity is so important to Christian faith? Some may find that to be a suitable explanation, while others will realize that since the original Christian church did not teach the Trinity, it could not have been an important doctrine. But despite that, many will be observing Trinity Sunday. Binitarian View: One God, Two Beings Before the Beginning Is binitarianism the correct position? What about unitarianism or trinitarianism? Is The Father God? What is the view of the Bible? What was the view of the early church? Jesus is God, But Was Made Man Was Jesus fully human and fully God or what? Did Early Christians Think the Holy Spirit Was A Separate Person in a Trinity? Or did they have a different view? Did the True Church Ever Teach a Trinity? Most act like this is so, but is it? Was Unitarianism the Teaching of the Bible or Early Church? Many, including Jehovah’s Witnesses, claim it was, but was it? Binitarianism: One God, Two Beings Before the Beginning This is a shorter article than the Binitarian View article, but has a little more information on binitarianism. Valentinus: The Gnostic Trinitarian Heretic He apparently was the first Christ-professing heretic to come up with the idea of three hypostases. The Anglo-Saxon model of ‘representative democracy’ allows—at least for now!—Christians locally and nationally to potentially influence (or express an opinion on) key issues. Our ‘world view’ based as it must be on the Christian Scriptures, however, is too often contrary to that of ‘the world’. But that should not hinder our taking a stand by peaceful and legal means and ‘…with a conscience void of offence towards God’—for example through a vote. J. Tkach of GCI (formerly WCG) also makes a similar recommendation (see GCI/WCG’s J. Tkach’s Latest On Voting). No, I do not believe that He would. If Christians are not supposed to vote, what should we do about leaders? Therefore I exhort first of all that supplications, prayers, intercessions, and giving of thanks be made for all men, for kings and all who are in authority, that we may lead a quiet and peaceable life in all godliness and reverence. For this is good and acceptable in the sight of God our Savior (1 Timothy 2:1-3). Notice that we are to pray for worldly leaders and those that have authority over us so that we may lead a quiet and peaceful life. The harvest truly is great, but the laborers are few; therefore pray the Lord of the harvest to send out laborers into His harvest (Luke 10:2). Brethren, pray for us (1 Thess 5:25). Finally, brethren, pray for us, that the word of the Lord may run swiftly and be glorified, just as it is with you, 2 and that we may be delivered from unreasonable and wicked men; for not all have faith (2 Thess 3:1-2). The will of the Lord be done (Acts 21:14). On earth as it is in heaven (Matthew 6:7-10). And that, I believe, should be the type of prayer that Christians have about elections. Church of God Outreach Ministries This was a CGI spin-off who says it is not a church. In Ecuador, the Tungurahua volcano exploded into action on Friday, forcing evacuation of at least seven villages and closing down the airport and public schools in Guayaquil, the country’s largest and most populated city. On the same day in Guatemala the Pacaya volcano erupted killing three and prompting President Alvaro Colom to declare a 15-day state of emergency. Guatemala’s La Aurora International Airport was closed because the runways and surrounding areas had to be cleaned of ash. Agatha, the first named storm of the 2010 Pacific hurricane season, has formed today south of Guatemala in central America. Since this newly formed system is moving very slowly over very high sea surface temperatures of at least 30 Celsius, and due to the conditions, it seems likely to stengthen further.Strong winds aren’t likely to be a problem, although persistent and torrential rain is. The main impact will probably be extreme heavy rainfall and hence devastating flash floods and mud slides. Areas at risk are southeast Mexico, Guatemala, El Salvador and as far inland as Honduras. The fault stretches from N.Y. to Alabama and could cause an earthquake with the right mix of ingredients. The fault is ancient, not active, and invisible to the naked eye. It was discovered using aerial magnetic survey data and seismic data. The fault and related fractures can still be potential quake-makers, under the right conditions. The impact of such an earthquake, if major, could be quite devastating. Though not as at risk as Haiti, the eastern USA is much less prepared for earthquakes than its western coast. We may be to this point as earthquakes and volcanic eruptions certainly would seem to qualify as “troubles”. Can the Great Tribulation Begin in 2010, 2011, or 2012? Can the Great Tribulation begin today? When is the earliest that the Great Tribulation can begin? What is the Day of the Lord? What is “the beginning of sorrows”? Have we begun or are we about ready for “the beginning of sorrows” to begin. Mexico, Central America, South America, and Brazil in Prophecy [Español: México, America Central, Suramérica, y el Brasil en profecíal] [Português: México, América Central, Ámérica do Sul, e Brasil na profecia] What will happen to those of Latin America? Will they have prosperity? Will they cooperate with Europe? Will they suffer in the future? What rule might the various Caribbean nations/territories play? EU Difficulties Ahead. Following an emergency meeting with Angela Merkel, Prime Minister David Cameron recently “signaled he was ready to veto any EU treaty to prop up the ailing euro—as he sought to calm pressure within his own party for a referendum on Europe.” Mr. Cameron, who clearly understands the vast implications of a veto from Britain, stated further,“It goes without saying that any treaty, even one that just applied to the euro area, needs unanimous agreement of all 27 EU states including the UK, which of course has a veto.” Critics suggest Cameron “could be forced to concede a referendum if the EU pushes ahead with plans to impose ‘European economic government.’” Cameron is in the difficult position of protecting British sovereignty while working with a deputy who is an EU supporter (Daily Mail, May 21, 2010). Speculation abounds concerning how the European debt crisis will impact the future configuration of the EU. Britain might not be alone in opposing another treaty, but a nation that uses veto power against the EU will likely not be viewed favorably. God prophesied that the Israelite-descended nations will be taken captive by a revived Holy Roman Empire (Isaiah 10:24; Ezekiel 5:8; Amos 5:25-27). Although Britain is not likely to be the only dissenter in such a treaty, the use of a veto by its Prime Minister could certainly create animosity that could further alienate other European nations. The United Kingdom has almost always had a highly strained relationship with the European Union, even though it is a member. At some point in time, the Europeans will turn completely against the United Kingdom, and it will be no more. Well before David Cameron made his statement, others in the UK indicated something similar that brought a warning to Britian that if it has financial problems the EU would not assist Britain (see EU Will Not Come to Britian’s Financial Aid). Europe will ultimately not allow Britain to exist as it now does. It will get that serious. TOKYO—The Japanese government issued a joint statement with the U.S. formally sealing a controversial agreement to keep a large number of Marines on the southern island of Okinawa, after the Obama administration made some small concessions to help Prime Minister Yukio Hatoyama save face for breaking a campaign promise. A Pentagon advisor and national defense expert says the recent revelation that North Korea was responsible for the sinking of a South Korean warship has compelled Japan to rethink its national security policy. Tensions over North Korea’s sinking of a South Korean warship are serious enough to have prompted Japan’s Prime Minister Yukio Hatoyama to break a campaign promise. He had pledged to close the U.S. Marine base in Okinawa, but he now says he has decided to keep Marine Corps Air Station located on the strategically important island, which is close to Taiwan and the Chinese mainland and not far from the Korean peninsula. For the time being, Japan will still rely on the USA, but it is starting to rethink that strategy. The reality is that the Bible tells of a time when “the kings of the sunrise” (Revelation 16:12, literal translation) will get together militarily. Since Japan is known as “the land of the rising sun”, it would seem that the prophecy in Revelation includes it. So, while Japan may decide at this time to re-arm to deal with North Korea and China, the most likely reality is that in the future it will decide to cooperate militarily with China and other Asian powers. Japan, Its Biblical Past and Future, Part 1: Any Witness? This is a brief article about Japan. Have they had any witness? Japan, Its Biblical Past and Future, Part 2: Prophecy Japan in prophecy. What is prophesied for Japan? Will God save the Japanese? Korea in Prophecy, Any Witness? Does God have a plan for the Koreans? Is Korea mentioned in any prophecies? Will Koreans be among the first in the Kingdom of God? 한국의 언어로 : 한국 예언, 모든 증인에? Asia in Prophecy What is Ahead for Asia? Who are the “Kings of the East”? What will happen to nearly all the Chinese, Russians, Indians, Koreans, and others of Asia? China in prophecy, where? Who has the 200,000,000 man army related to Armageddon? Posted in Prophecy | Comments Off on Will Japan Re-Arm? Friday, May 28, 2010; 9:05 AM As President Obama prepared to visit Louisiana Friday to assess a growing environmental disaster on the Gulf Coast, the chief executive of BP pointed to progress in combating a five-week-old oil spill in the Gulf of Mexico but said it would take another two days to know whether the latest effort has been successful. Appearing on morning news shows, BP chief Tony Hayward said the company would resume pumping heavy mud Friday afternoon into a blown-out, gushing oil well about a mile below the surface in a technique known as “top kill.” BP began the top-kill operation Wednesday afternoon in a risky attempt to cap the well. Haywood said on CNN that a live video feed of the broken well showed that the material now gushing from it is mud, which he called “good news” in efforts to plug the leaking oil. But he said engineers would not know for another 48 hours whether the top-kill method has worked, and he retracted his early prediction that environmental damage would be largely avoided. The silence of wildlife in the affected regions suggest that the environmental impact of this disaster are significant. This will affect the fishing industry, food supply, wildlife, and tourism. While I do not at all wish to minimize the impact this environmental disaster will have on the Gulf Coast, it is the economic implications that I wish to focus on today. This morning, at 11:35 am EDT, I am scheduled to appear on The Don Sherwood radio show on 1340 am in Lake Worth, Florida (it can be listened to on the internet from their website, which is http://www.wpbr1340am.com/) to discuss this. If I get a chance, I will try to explain that as bad as the environmental disaster is, it will pale in comparison to what will happen to the USA in a few years according to biblical prophecy. The USA will not become energy independent. The USA will not be able to significantly eliminate its trade deficits. The USA will have less tax revenues. Some States of the USA will have more financial problems. Southern California will have more financial problems. The USA will not be able to pay off its national debt. The USA will likely increase its debt. The USA will more quickly get to the prophesied “appointed time” of “the end” where its creditors will rise up against it and the USA will be no more. What is not his–how long? And to him who loads himself with many pledges’? 7 Will not your creditors rise up suddenly? Will they not awaken who oppress you? And you will become their booty. 8 Because you have plundered many nations, All the remnant of the people shall plunder you (Habakkuk 2:3,6-8). The above will be fulfilled, and the USA is already the most indebted nation of all time. And it appears that it will get even worse. Now, I am not saying that this one disaster marks the end of America. But what I am saying is that on top of everything that has been going on the past several years (and thus, I am NOT limiting this to the Obama Administration, though it has greatly accelerated the process), the Horizon Gulf oil spill is another indicator that the USA is headed closer to its destruction, which is prophesied to happen after its creditors rise up against it. Thus, the economic impact of the Gulf oil spill is likely to be greater than almost everyone is publicly admitting. Can the Great Tribulation Begin in 2010, 2011, or 2012? Can the Great Tribulation begin today? What happens before in the “beginning of sorrows”? What happens in the Great Tribulation and the Day of the Lord? When is the earliest that the Great Tribulation can begin? What is the Day of the Lord? 2012 and the Rise of the Secret Sect This is a link related to a book by Bob Thiel (COGwriter). This also has YouTube videos. This book documents and explains hundreds of prophecies. And since it was published, at least eleven have already started to come to pass. You are currently browsing the Church of God News weblog archives for May, 2010.